(no tour on: 24-26 Dec, 01 Jan). Alternatively, join us at our meeting point near the Old Town Square. Tour Ends: Near Old Town Square. A half day trip to the Terezin Memorial (Theresienstadt) from Prague. Terezin is a World War II concentration camp and Jewish ghetto. After picking you up from your Prague hotel, we drive for around 40 minutes to reach the Terezin Memorial site. A former garrison town, Terezin was built at the end of the 18th century by Emperor Joseph II as an ingenious system of military fortresses. However, when the Nazis invaded the Czech Republic in World War II, this huge area was converted into a concentration camp and Jewish ghetto. The Small Fortress (also known as the Prague Gestapo Prison) was the concentration camp. It was used to house mostly political prisoners. Around 90,000 people passed through here. The Big Fortress, comprising 80% of the Terezin Memorial, was the Jewish ghetto. Here we visit the Ghetto Museum (Terezin Museum), the Columbarium, the Prayer Room (Hidden Synagogue), the exhibition at Magdeburg Barracks, and the Jewish Cemetery Crematorium (please note: cemetery is closed on Saturdays). Many aspects of Terezin are eerily preserved in, or restored to, their 1940s state. Displays include a prison dormitory and the belongings of some of the unfortunate people who resided here - their clothing, drawings, music, poetry and other precious artefacts. Through these we gain an understanding of what life was like for the inmates, and of their hopes and despair. There are also audio visual displays and documentary films featuring archive material from the era. In all, around 32,000 prisoners passed through the Big Fortress. This sorry episode in the history of Terezin, and of humanity in general, will no doubt leave unanswered questions in your mind, as to how or why such atrocities can occur. As the tour is of a sensitive nature, we only run it in small groups. It is led by an expert guide in Jewish history, to ensure participants gain a proper understanding of the subject. For refreshments, the onsite kiosk stocks a limited range of snacks and drinks, and is not always open. Therefore we recommend bringing your own refreshments. Prague Experience sightseeing tours are in English. They are led by professional, licensed tourist guides and use modern, air-conditioned mini-coaches. The trip finishes back in Prague, near the Old Town Square. Note: Many inhabitants of Terezin during the war were deported from the Jewish Quarter in Prague. Therefore, to trace the origins of the Terezin story you may wish to also book the Jewish Quarter Walking Tour, which is led by the same expert guides as this tour. 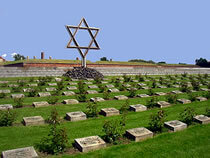 Hotel pick up + Guided tour & admission to all monuments in the Terezin Memorial.